One Nail To Rule Them All: Guest post for The Crumpet! Hope you like them! I'm afraid there will be no Then and Now post tonight as I'm super super busy, I'm going to try my absolute best to get them done for tomorrow but if not they'll be up monday for sure! Omg they are too cute!!! These are awesome. And you are awesome for doing them!! I remember this, I had to dress in my pajamas for a school play for bananas in pajamas. Love the nails they are so neat. Ohh!!! It's amazing!! 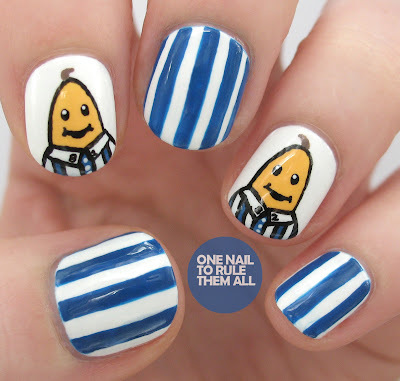 I <3 your blog and your art nail!!! I really like these. That cartoon was part of my childhood.